Visitors to my apartment, beware: if you show any kind of Leeroy-like tendencies, you may be swarmed by the dragon whelps lurking in my bookcase! Two and a half years after I made the first one and several months after finishing the first set of five, I’ve completed the last of my planned set of dragon whelplings. After I’d picked out materials for the original five dragonflights, seeing both orange- and purple-bellied dragons among the trophies of the Dragonmaw in Twilight Highlands gave me the idea of making an Onyxian whelpling, too. When I found some fun color-shifting fabric, making nether and chromatic whelplings gave me a perfect excuse to buy some. A white-on-black-on-black infinte dragonling would also be cool. And Lil’ Tarecgosa, with her fancy horns, presented an intriguing challenge. After I saw how this first dragonling turned out, I modified the pattern. Immediately after I made the green one, I made one for my nephew and nieces on BTH’s side of the family using these fun, fun fabrics from my sister-in-law’s stash. The wings of this one are a sandwich with felt in the middle and are sewn into the back seam. I added a row of spikes down the middle of the back to please my mother-in-law, who thought that dragons ought to have them. This dragonling is the first one made with the modified pattern. The next year, I made one for my nephew on my side of the family for Christmas. The wings of this one are stiffened with pieces of manilla folder carefully inserted prior to sewing the wings into the back seam. This material is actually the reverse side of a brocade that is a pale old gold color on the “right” side. This dragonling sat half-finished for a very long time. Perhaps that’s why he turned out so froggy. This material was a royal pain to work with. Never again! 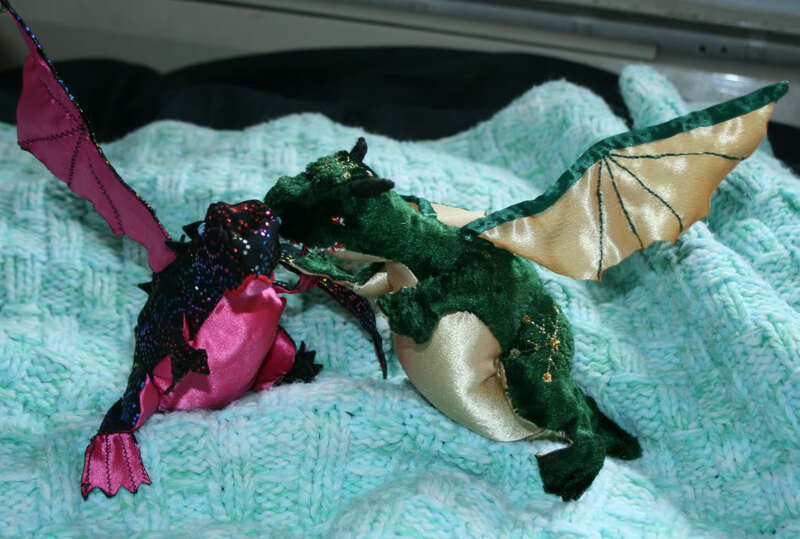 Around the time that I made this dragonling, I started sewing the wings on in a slightly different way. I think the shape of the head and neck turned out the prettiest on this one. This one went quickly because I didn’t have to embroider any ribs on the wings! The black on the top of the head is a scrap of the same material that I used for the black and Onyxian dragonlings. I used a larger size of bead to make the large teeth this dragonling has in the game. After sewing a row of felt spikes into the back seam, I hand-sewed the crest of spikes onto the middle of the forehead. I made the curved horns from a longer felt cone than I used for the other dragonlings, stitched together in the middle to make them bend. Because I’d used a brocade for the bronze one, it seemed right to also use a brocade for the infinite one. This brocade is right-side out, though. I saved Lil’ Tarecgosa for last because she was the most complicated! All the gold decorations are made from gold bias tape. The tail jewel came from a piece of fancy curtain/upholstery fringing. The horns are a pipe cleaner doubled over and twisted around itself to make the basic shape, then wrapped with long, narrow strips of felt. I made the gold square and sewed the pink button onto it, then sewed that to the front of the horns. I couldn’t find a fancy ribbon that was that narrow, so I had to embroider the gold decorations onto a plain purple ribbon before sewing it onto the horns. After the whole horn assembly was completed and the eyes and mouth had been put on, then I sewed the horns onto the head. After making a dozen dragons, I think I’m done with dragons for awhile! They are amazing. I especially love the infinite one, he has a decidedly wicked look. Thanks! I’m rather fond of the infinite one, too. They are amazing! I can’t decide which is my very favorite though, might be the infinite one but Lil’ Tarecgosa is awfully cool too! Thanks! I think my favorites are the red, chromatic, and Lil’ Tarecgosa. These are sooo cool! I think my favorite is the shimmery purple one in the middle. Fantastic job on all of them! Fantastic effort on all of these. I think my favs are the onyxian and infinite. It was a lot of effort, for sure! OMG, I really love these! Are you willing to share the pattern? I mean, I haven’t sewed any plushies since I was in home-ec class, and I don’t have a sewing machine, but I honestly might try my hand at making these if I had a pattern. I would totally buy those! I bet if you made an Etsy shop, you’d make a killing. If I started selling them, however, then making them would become *work* instead of play….